31 Days of Writing Prompts: Share your best healthy dinner recipe. back when i worked the 9-to-5, this was frequently my lunchtime staple -- a healthy, hearty salad full of all of my favourite things (though i skipped the raisins because i don't like dried fruit in my salad, and i left out the raw onion because i'm not a fan of tasting red onions for days) that i could prep the night beforehand and just pack and go the next day. in fact, making it the night beforehand is key to letting the dressing soften up the kale -- just be sure to pack a little container of walnuts and hemp seed separately to top it with. also, i would make a huge batch of cooked chicken breasts and just dice one up to toss on top. you can't go wrong with a ton of veggies and protein. this one is a favourite of both the import boy's and mine, because it's so simple and fast, but it tastes amazing if you use really good ingredients (i actually take the time to make my own chicken broth, but eh). again with the chicken and kale combination - one of my favourites - but this time with added bacon! the original recipe uses leftover turkey from thanksgiving, but i like to buy a cooked rotisserie chicken from the supermarket and just shred it up. also, flavourings are key here -- check the salt, be sure to use smoked paprika (not the regular kind), and i always toss in a parmesan rind when the broth goes in. another recipe that ticks off all the boxes for me: healthy, few ingredients, relatively cheap to make, and yes, kale. i have the unfortunate habit of devouring most of this pie as soon as it comes out of the oven, but if you can restrain yourself, it makes a great lunch hot or cold, especially if you top it with a few slices of avocado and eat it with a small side salad. although getting decent parmesan may be the most costly part of the recipe, it's worth it -- i've made this with subpar parm before and it doesn't taste nearly as good. (also, i usually up the eggs from 4 to 6, or even 8, since otherwise it tends to be more like a ton of kale held together by a bit of omelette) oh, and use some butter to grease the hell out of the pan first -- this one sticks. if you want to go really minimalist and cheap but with huge flavour, this is the perfect recipe. it's simply roasted cauliflower, onion, curry powder, broth, salt & pepper, and cayenne powder. that's it. boil it together, blend it, and voila, you have curried cauliflower soup. even though topping it with a drizzle of honey might sound weird, trust me -- it's necessary to bring out all the flavour of the curry powder (i always use hot curry powder rather than the mild stuff). whenever i make this recipe, i tend to double it or even quadruple it, and i never skip adding 1/4-1/2 teaspoon of cayenne powder at the end. this is also where it's super beneficial to have a stick blender, btw. this is a relatively new recipe to my healthy-dinner arsenal, but the boy loves it (he loves anything buffalo-wing flavoured), and i love how cheap it is (ground chicken is almost always on special and way less costly than chicken breasts). i wanted to find a healthier and more filling alternative to wings, and this is a most worthy facsimile. get a bottle of frank's buffalo wing hot sauce and go to town -- sour cream on top is a must, or even blue cheese, if you've got the cash. here is a bonus, a recipe i actually put together myself! 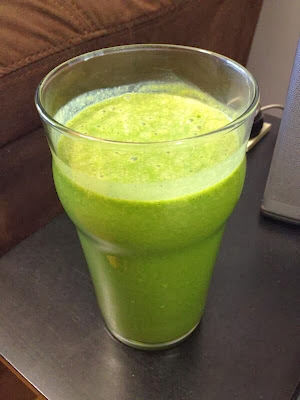 : my favourite green monster smoothie. i don't drink this for dinner, but it has been my breakfast on more than a few occasions, and here's what's in it: 1/2 cup unsweetened vanilla almond milk + 1/2 cup water + 1 teaspoon maca powder + 1/2 scoop vanilla protein powder + 1 tablespoon almond butter + a couple huge shakes of cinnamon + 2 large handfuls baby spinach + 1/2 frozen chopped banana + 3 ice cubes. put those items in your blender in that order and then mix it up on your highest setting. it may look like something radioactive, but it's surprisingly filling and also a great energy booster first thing in the morning.